The concrete slump test is an empirical test that measures the workability of fresh concrete. The test is performed to check the consistency of freshly mixed concrete in a specific batch. Consistency refers to the ease and homogeneity with which the concrete can be mixed, placed, compacted and finished. This test is most widely used due to the simplicity of apparatus and simple test procedure. 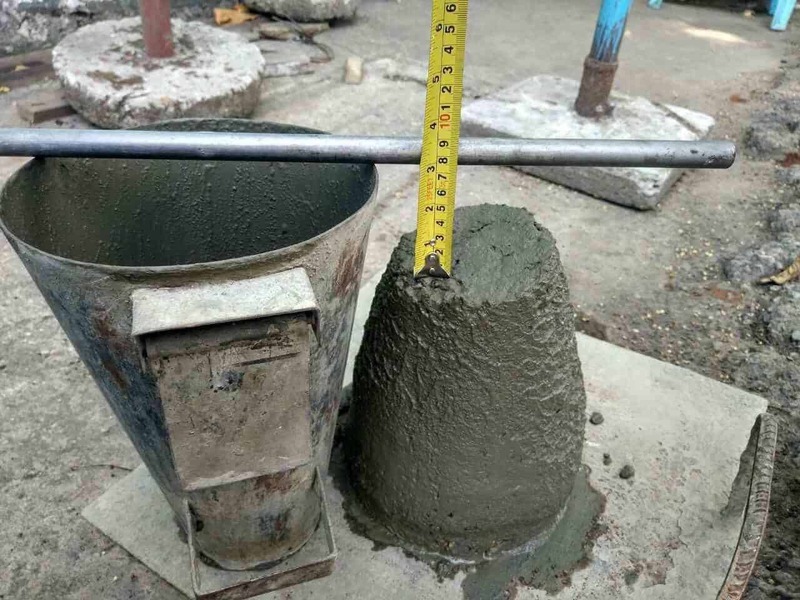 The slump test gives satisfactory results for the concrete mix of medium to high workability and unfortunately, it does not give the correct indication of low workability, which may give zero slumps. This test is also known as slump cone test. 1. Mould or slump cone with a height of 300 mm, bottom diameter 200 mm, and top diameter 100 mm. 1. First, clean the inner surface of the empty mould and then apply oil to it. 2. Set the mould on a horizontal non-porous and non-absorbent base plate. 3. Fill the mould fully by pouring freshly mixed concrete in three equal layers. 4. Stroke each layer 25 times with the standard tamping rod over the cross-section. 5. After stroking 25 times the top layer is struck off level, now lift the mould slowly in the vertical direction without disturbing the concrete cone. 6. Use the measuring scale to measure the difference level between the height of the mould and the concrete sample. 7. The subsidence of concrete is known as the slump and the value of slump is measured in mm. True Slump: The concrete mass after the test when slumps evenly all around without disintegration is called the true slump. Shear Slump: When one-half of the concrete mass slide down the other is called the shear slump. This type of slump is obtained in a lean concrete mix. Collapse Slump: When the sample is collapsed due to adding excessive water, it is known as collapse slump. Zero Slump: For very stiff or dry mixes it does not show any changes of the slump after removing the slump cone. 1. The procedure of slump test is simple and easy than any other workability test. 2. Inexpensive and portable apparatus is required for this test. 3. Slump test can be performed at the construction site as well as in the laboratory. 1. The slump test is limited to concretes with the maximum size of aggregate less than 38 mm. 2. The test is suitable only for concretes of medium or high workabilities (i.e having slump values of 25 mm to 125 mm). 3. For very stiff mixes having zero slumps, the slump test does not show any difference in concretes of different workabilities. ALSO READ – WHAT IS LIGHTWEIGHT CONCRETE? IF YOU LIKED THIS ARTICLE THEN PLEASE SUBSCRIBE TO OUR NEWSLETTER. Slab steel type. Bandap bar. If a slump test is not taken on site, but it passes the compression test….can a client reject the concrete pour? I am following your daily posts it is so interesting,, I am upgrading my knowledge a lot , if it is possible please try to share us also the knowledge regarding to Highway,, keep it up! Thanks. How to measure flow test of concrete?